Dan Bejar, the prolific songwriter behind Destroyer, is at it again with Kaputt: This, an indomitable album with a mild-mannered demeanor, swings between contradictory states without seeming somehow troubled. It feels almost on the periphery, and as a result it takes some sharp focus to really hone in on some of the qualities on display. It's laid-back, it's comfortable, and it's not entirely too challenging, but there's depth here when it's needed. You can pick up on the album’s major themes in a couple of listens, but the markedly subtle approach taken here isn’t just more engaging, it’s more rewarding. Sure, Bejar's got a few tricks up his sleeve, but that’s not where everything really comes to fruition. No, it’s when Kaputt’s tracks swell with emotion — never intense emotion, but emotion nonetheless — that the album’s potential is fulfilled. Kaputt is full of malaise in the best of ways; when Bejar flaunts his songwriting prowess, you can't help but sympathize with his apparent malcontent (not angst, though; this never feels angst-ridden.) Sometimes, Kaputt just radiates, but even when it’s at its most radiant, the resident vagueness keeps heads scratching to the beat. 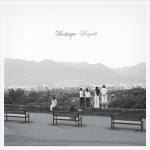 And Kaputt is never too rambunctious, but it does manage its fair share of irreverent pop attitude: Bejar's inclusion of trumpet that recalls late-career Miles Davis hardly places this album in the realm of tame indie rock. There’s not a lot of extant diversity here, but in its place, Bejar works consistency into the mix. Don’t get me wrong, it’s not that this is really a boring album in a contemplative mask, but if you’re looking for something fast-paced for an attention-lacking first cousin or something, be warned: Dan Bejar’s not treating time and breathing room as luxuries to be meted out in small measure. Kaputt’s never plodding or laborious, but it certainly takes at least a minimal amount of attention and time to make it through every track without distraction. This is a solid album with some great ideas, and when it’s given the attention it really deserves, those qualities come out in droves. It’s a perfect release for inevitable January snow: Graceful, inviting, and evocative as ever, Dan Bejar’s assembled the necessary parts for an early-year success.